Hosam Maher Husein Smadi, a 19-year-old Jordanian, was arrested on charges he plotted to bomb Fountain Place, a downtown Dallas skyscraper. A Jordanian national was arrested Thursday and charged with attempting to bomb a Dallas skyscraper, the FBI said. Hosam Maher Husein Smadi, 19, will make his first appearance in U.S. District Court before Magistrate Judge Irma C. Ramirez on Friday morning. 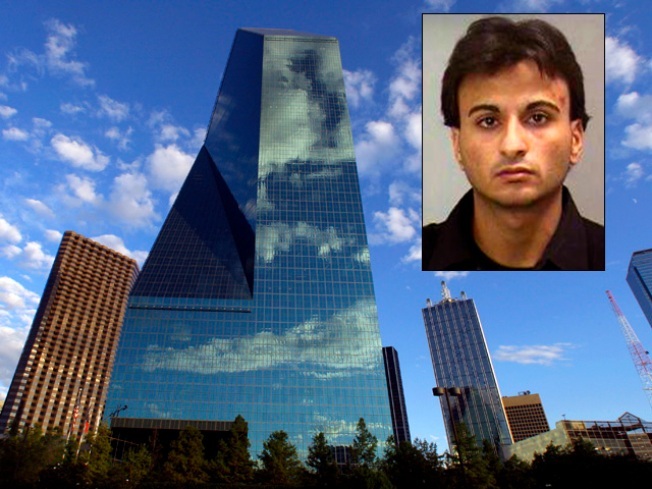 Smadi was arrested near Fountain Place, a 60-story glass office tower in downtown Dallas. He is accused of placing an inactive bomb in the building's parking garage, investigators said. The FBI said Smadi believed the device, which was provided by an undercover agent, was a car bomb. Smadi is accused of targeting the Wells Fargo Bank offices in Fountain Place, which is located at 1445 Ross Avenue, according to an arrest affidavit. Investigators said Smadi was in the country illegally and lived and worked in Italy, Texas, which is about 45 miles south of Dallas. The FBI said it believes it has a strong case against Smadi, but officials said the level of concern about him as a terrorist was relatively low. Federal officials said the case has no connection with the major terrorism investigation under way in Colorado and New York or the Thursday arrest of a man facing similar charges in Springfield, Ill.
Smadi had been the focus of an undercover FBI investigation and was under continuous surveillance since undercover agents said they discovered him in an online group of extremists. Undercover FBI agents made more than 60 communications with Smadi since early March. During those interactions, Smadi made clear his intentions of acting as a solider for Osama bin Laden and al Quaida in conducting a violent jihad, according to an arrest affidavit. Smadi initially wanted to target Dallas/Fort Worth International Airport, according to the arrest affidavit. On July 16, he contacted one of the undercover FBI agents and said he changed his mind about the target, according to the document. Smadi allegedly decided the aiport was not a viable target because the security was too strong. Smadi then allegedly told the undercover agent he wanted to target a larger building containing the bank. "Let us make it the big fish instead of the smaller fish; they are all fish in one sea -- the main bank for the city and not the branch that we had identified. God willing, the strike will be certain and strong. It will shake the currently weak economy in the state and the American nation because the bank is one of the largest banks in the city. ...The bank's exterior is made of glass. The bank has billions of dollars. Let's say that the bank has collapsed and they took the money out. The losses will be excessive in credit card information. Millions of people would incur losses: unemployment, poverty, hunger, and a strike to the head of the government. Don't forget the psychological impacts for the loss of this beautiful building... Of course, our joy will be in the success of this operation." On June 24, while meeting with an undercover FBI agent at a Dallas hotel, Smadi allegedly stated he had a new idea to target the buildings belonging to the biggest credit card companies, such as American Express or Visa. Smadi said credit cards drive America, and that he desired to attack one of the main locations where the building accommodates the management and administration, according to the arrest affidavit. "We will have a clever idea.. I have a car.. this car will be the bomb... but there will be a routine before this car... I would have entered the building prior... to see how the security is, how they search... what type of security.. so if a bomb is planted, for instance, in the car, timed or to detonate remotely... a very fast operation, smart, and decisive." On July 21, an undercover agent traveled to Italy, Texas, to pick up Smadi, who directed him to drive to a Wells Fargo bank at the Fountain Place office building located in downtown Dallas, according to the arrest affidavit. Smadi allegedly conducted reconnaissance of the building and told the undercover agent he had located a bathroom on the basement level that would be a good location to "plant a bomb." Smadi told the agent the bathroom had a locking door and a drop ceiling that could be accessed by standing on the toilet seat, according to the arrest affidavit. On Aug. 26, Smadi discussed the expectations of the explosion with an undercover agent, the arrest affidavit said. "I will plant it in the...foundations...exactly under the building... when it explodes, it will shake the foundations so that the building, if it is heavy in weight, tons, all that will come down," he allegedly told the agent. Smadi allegedly showed the undercover agent what he described as building plans and stated, "What I discovered was that this building, my dear sir, is the same building as Sept. 11 in New York... That it is a trade building." Smadi allegedly said he would have preferred to do the attack on "11 September" but decided to wait until after the Islamic holy month of Ramadan. At the conclusion of the meeting, it was decided that a vehicle-born, improvised-explosive device would be used, according to the arrest affidavit. Federal agents built a device that was designed not to explode and put it in a 2001 Ford Explorer Sport Trac. On Thursday, Smadi allegedly drove to Dallas to meet the undercover agent and got into the Ford Explorer that contained what he believed was a weapon of mass destruction, according to the arrest affidavit. He is accused of then driving through downtown Dallas, entering the parking garage under Fountain Place building and then parking the vehicle. Smadi attempted to ignite and detonate the explosive device by setting the device's timer and flipping the power switch on the explosive device before leaving the garage on foot, the arrest affidavit said. Smadi then allegedly walked over to the undercover officer and got into another vehicle. They drove several blocks away so that Smadi could remotely detonate the bomb via cell phone, the affidavit said. The agent offered Smadi earplugs, but he declined, indicating he wanted to hear the blast, according to the affidavit said. The affidavit said Smadi then dialed the cell phone, believing it would detonate the bomb. The phone number Smadi dialed rang to the phone of law enforcement officials, and he was arrested by the FBI Joint Terrorism Task Force and other assisting law enforcement officers. Smadi will make his first appearance in U.S. District Court before Magistrate Judge Irma C. Ramirez on Friday morning. "The identification and apprehension of this defendant, who was acting alone, is a sobering reminder that there are people among us who want to do us grave harm,” said U.S. Attorney James T. Jacks. Dallas Mayor Tom Leppert thanked the FBI in a statement released Thursday night. Danny Deffenbaugh, a retired FBI agent who supervised the bureau's Dallas office during the Sept. 11 terrorist attack in New York said federal officials headed of what could have been a serious terrorist threat to Dallas. "They obviously thwarted a terrorist event, because he wanted to make sure that bomb was going to go off," Deffenbaugh said. Read "Arrest of Accused Would-Be Bomber Shocks Italy, Texas"